Is New-Age Technology a Leading Cause of Adolescent Hearing Loss? As technology becomes more advanced and prevalent, the number of children with hearing loss grows. In the United States, twelve to fifteen percent of the 10 million people with hearing loss are school-aged children. The abundant use of new-age technology like music players and gaming systems have contributed to this increased percentage. Hair cells in the inner ear vibrate and transmit nerve impulses to the hearing center of the brain. These hairs can lose their ability to transmit sound if damaged by loud noises. Unlike other parts of the human body, these hairs cannot be repaired or regenerated. Therefore, a child’s hearing loss can progressively get worse. In other words, hearing loss cannot be fixed, only remedied by such things as hearing aids. Noises exceeding 85 decibels (decibels being the unit to describe sound intensity) are capable of causing hearing loss. Many everyday noises can reach or even exceed this number. In fact, at full volume, the iPod can reach 115 decibels, a volume unsafe for listening. Comparatively speaking, 115 decibels is almost double the volume of a normal conversation, which is measured at approximately 60 decibels. It is essential that parents understand the risk and dangers that loud noises pose to their children. Where loud noises may be present, parents should encourage the use of noise-cancelling headphones or silicone/wax earplugs. It can be difficult to determine what is too loud, but one thing is for sure, if a sound is capable of hurting an adult ear, it will certainly hurt a child’s sensitive ear. 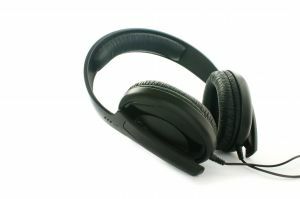 In addition and likely most common, if you are able to hear your child’s music from the headphones which lay rested in their ears, it is safe to assume they are listening at an unsafe volume. Music players and other noise producing devices occupy a large portion of a child’s time, so unless these devices are used reasonably, they have the potential of creating hearing loss and a number of other issues. These issues include but are not limited to, poor performance in school, a constant ringing or buzzing noise, and / or deafness. Is it Hearing Loss? How do you know if a child has hearing loss? There are a number of tell tale signs, which include a child’s tendency to say “huh?” or “what?” (More than what a child normally would), turning the TV up louder, and doing poorly in school. It is important that parents monitor their child’s hearing through routine hearing checks, which can often be administered by a primary care doctor or Ear Nose and Throat physician. For more information on this topic, see Hearing Loss in Adolescents.